Background: Reduced brain insulin signaling and low CSF-to-plasma insulin ratios have been observed in patients with Alzheimer disease (AD). Furthermore, intracerebroventricular or IV insulin administration improve memory, alter evoked potentials, and modulate neurotransmitters, possibly by augmenting low brain levels. After intranasal administration, insulin-like peptides follow extracellular pathways to the brain within 15 minutes. Objective: We tested the hypothesis that daily intranasal insulin treatment would facilitate cognition in patients with early AD or its prodrome, amnestic mild cognitive impairment (MCI). The proportion of verbal information retained after a delay period was the planned primary outcome measure. Secondary outcome measures included attention, caregiver rating of functional status, and plasma levels of insulin, glucose, β-amyloid, and cortisol. Methods: Twenty-five participants were randomly assigned to receive either placebo (n = 12) or 20 IU BID intranasal insulin treatment (n = 13) using an electronic atomizer, and 24 participants completed the study. Participants, caregivers, and all clinical evaluators were blinded to treatment assignment. Cognitive measures and blood were obtained at baseline and after 21 days of treatment. Results: Fasting plasma glucose and insulin were unchanged with treatment. The insulin-treated group retained more verbal information after a delay compared with the placebo-assigned group (p = 0.0374). Insulin-treated subjects also showed improved attention (p = 0.0108) and functional status (p = 0.0410). Insulin treatment raised fasting plasma concentrations of the short form of the β-amyloid peptide (Aβ40; p = 0.0471) without affecting the longer isoform (Aβ42), resulting in an increased Aβ40/42 ratio (p = 0.0207). Conclusions: The results of this pilot study support further investigation of the benefits of intranasal insulin for patients with Alzheimer disease, and suggest that intranasal peptide administration may be a novel approach to the treatment of neurodegenerative disorders. The identification of reduced brain insulin signaling in AD has important therapeutic implications. Given insulin’s salutary effects on cognition and its modulation of AD pathophysiology, normalizing insulin availability to the brain may have beneficial effects. Raising insulin in the periphery is not likely to be an effective long-term strategy to accomplish this goal; chronic insulin elevations may have undesirable metabolic consequences such as induction of hypoglycemia and insulin resistance. Furthermore, patients with AD often have concomitant insulin resistance, which causes a reduction in insulin transport capacity across the blood–brain barrier that might prevent adequate levels from reaching CNS targets.7 With intranasal administration, insulin-like peptides bypass the periphery and the blood–brain barrier, reaching the brain and CSF within minutes via extracellular bulk flow transport along olfactory and trigeminal perivascular channels, as well as through more traditional axonal transport pathways.8,9 In the present study, we used a randomized, placebo-controlled design to determine if 21 days of intranasal insulin treatment would enhance cognition and daily function in patients with early AD or amnestic mild cognitive impairment (MCI). We also investigated the effects of intranasal insulin on plasma levels of the β-amyloid peptide (Aβ), based on previous work showing that raising plasma insulin reduces plasma levels of the longer specie (Aβ42) for normal adults, but not for patients with AD.10 Although the role and significance of plasma Aβ is not well-understood, longitudinal studies have documented higher plasma Aβ42 levels at prodromal or early stages of AD.11 One mechanism through which intranasal insulin may affect Aβ is through its effects on glucocorticoids, which regulate the amyloid precursor protein (APP) and β-APP cleaving enzyme.12 A previous study reported that 8 weeks of intranasal insulin treatment reduced plasma cortisol levels in young adults.9 We therefore measured plasma cortisol levels prior to and following the 21-day treatment period. Results from our pilot clinical trial suggest that intranasal insulin treatment improves cognition and modulates plasma Aβ and cortisol levels, thereby providing a clear rationale for further large-scale investigation of this novel therapeutic approach. This study was approved by the Human Subjects Review Committee of the University of Washington, and conducted in the Clinical Research Center of the VA Puget Sound. Written informed consent was obtained from all subjects and the legal representatives of patients with AD. The trial was not registered with ClinicalTrials.gov because it was a preliminary single-site trial of limited duration and enrollment. Eligibility screening and enrollment occurred from August 2005 through May 2006, and relevant data regarding study flow are provided in figure 1. Enrolled participants included 25 adults with AD (National Institute of Neurological and Communicative Disorders and Stroke–Alzheimer’s Disease and Related Disorders Association criteria; n = 11) or MCI with amnestic features (n = 14), a disorder widely believed to represent a prodromal stage of AD in the vast majority of cases.13 Sample size was determined based on previous studies of the effects of insulin on memory.14 Diagnoses and study eligibility were determined by neurologist, psychiatrist, and neuropsychologist consensus following cognitive testing, medical history, physical examination, electrocardiogram, and clinical laboratory screening as previously described.15 All subjects were free from psychiatric disorders, alcoholism, severe head trauma, hypoxia, neurologic disorders other than AD, renal or hepatic disease, diabetes, chronic obstructive pulmonary disease, congestive heart failure, or cardiac arrhythmias. Participants were randomly assigned using a random numbers table to receive insulin (n = 13) or placebo (n = 12). Treatment assignments and preparation of insulin or saline vials was carried out by a research nurse who was not involved in data collection. All study personnel involved in data collection were blinded to treatment assignment. Treatment groups were comparable in terms of age, education, body mass index, or dementia severity as assessed by the Mattis Dementia Rating Scale (table). One member of the placebo group moved during the study and discontinued participation. Saline or insulin (Novolin R, Novo Nordisk) was administered under the supervision of the participants’ caregiver with a ViaNase Electronic Atomizer (Bothell, WA). The ViaNase device has been specifically designed to deliver drugs to the olfactory region to maximize drug transport to the CNS. This device releases a metered insulin (20 IU) or saline dose into a chamber covering the subject’s nose, which then was inhaled by breathing evenly over a 2-minute period. This method allowed administration of smaller particle sizes to increase drug deposition in the upper nasal cavity without transporting the drug to the lungs.16 A total volume of 2 mL was administered each time. Participants and their caregivers received 2 hours of training in use of the ViaNase device. All participants and caregivers were deemed proficient in the use and maintenance of the device. Intranasal treatment was administered twice daily, immediately after breakfast and dinner in the participant’s home, under the supervision of the caregiver, for 21 days. This time period approximated that used in a study of healthy young adults,9 but was shortened slightly to minimize the possibility of adverse reactions in an older, neurologically compromised sample. Different but comparable versions of cognitive tests were administered prior to and following 21 days of treatment. The primary outcome measure was a sensitive measure of memory, story recall, for which subjects listened to a story containing 44 informational bits. Subjects were asked to recall the story immediately and after a 20-minute delay. Credit was awarded for each bit recalled verbatim or accurately paraphrased. The amount of information retained over the delay was calculated as immediate recall/delayed recall, and is a sensitive measure of early memory impairment in mild AD.17 Secondary measures included a frontal-executive test of selective attention and response inhibition (Stroop Color-Word Interference Task). This test included two types of trial blocks.18 For both types of trials, color names were presented one at a time, via computer equipped with a voice key, with concordant or discordant font colors (e.g., the word “red” presented in red or green font). At the beginning of each trial, an instruction screen was presented to remind the participant to “NAME THE INK COLOR.” Practice trials were administered to ensure the participant understood the task. Participants’ vocalized responses terminated each trial and initiated the next. Errors, response content, and voice onset time were recorded. The mean voice onset time for discordant trials was designated as a secondary measure. Separate analyses were conducted with correct trials and with all trials, and produced identical results. As an additional secondary measure, participants’ caregivers also completed the Dementia Severity Rating Scale (DSRS) at baseline and at the end of the study, in which they rated change in the participant’s cognitive, social, and functional status over a specified period of time. The DSRS includes items relating to memory, orientation, judgment, social interactions, home activities, personal care, speech/language, and recognition of others.19 Higher scores indicate greater impairment. Blood was collected at baseline and after 21 days of treatment from fasting participants for analysis of biochemical secondary outcome measures: glucose, insulin, glucocorticoids, and plasma Aβ. Given that patients with AD show greater differences in plasma Aβ following nutrient and plasma insulin administration, we measured Aβ 90 minutes following a standard balanced meal. Samples were immediately placed on ice and spun at 2,200 rpm in a cold centrifuge for 15 minutes, after which plasma, serum, lymphocytes, and red blood cells were aliquoted into separate storage tubes and flash frozen at −70°C. To investigate the effects of daily intranasal insulin administration on plasma Aβ levels, we measured Aβ40 and Aβ42 levels after overnight fasting and 90 minutes later, following a standard balanced meal, at baseline and day 21. Plasma Aβ40 and 42 levels were quantified with a sandwich ELISA using 6E10 (Signet Laboratories, Dedham, MA), a mouse monoclonal antibody to amino acids 3–8 of Aβ, for capture and biotinylated rabbit polyclonal antibodies specific for the C-terminal of Aβ40 or 42 (Signet Laboratories) for detection. Nunc Maxisorp plates were coated using 2 g of 6E10 per well in 0.05 M carbonate buffer, pH 9.6, overnight at 4 °C. Plates were then blocked with 1% bovine serum albumin (BSA) for 1 hour shaking at room temperature. Synthetic Aβ40 or 42 (Bachem, Torrance, CA) was diluted in 1 mg/mL in 70% formic acid, then diluted in 0.5% BSA, 0.05% Tween-20, 1% Triton-X 100 in phosphate buffered saline (PBS), pH 7.4, to concentrations of 15.6 pg/mL to 2,000 pg/mL for the standard curve. Tween-20 and Triton-X 100 were added to plasma samples to a final concentration of 0.05% and 1%. Addition of the detergents to the plasma increased the recovery of Aβ from the plasma. Complete protease inhibitor cocktail (Roche Applied Science, Indianapolis, IN) were added to both standards and samples. Following blocking, samples and standards were added to the plate (100 μL per well), covered, and incubated overnight shaking at 4 °C. The plate was washed and 100 L of 1 g/mL biotinylated Aβ40 or 42 specific antibodies were added and incubated for 1 hour shaking at room temperature. Following another wash, bound antibody was detected using a streptavidin/horseradish peroxidase conjugate and tetramethylbenzidine as a substrate. The limit of detection for this assay is 15 pg/mL and no cross-detection of Aβ40 or 42 with anti-Aβ 42 or anti-Aβ 40 is seen at concentrations as high as 3 ng/mL. All samples from the same subject, and equal numbers of subjects from each treatment group, were analyzed on the same ELISA plate to reduce the contribution of plate to plate variability to any observed differences. Assignment of samples to plates was arranged by a technician who was not associated with the study and was not involved in sample analysis. The coefficient of variation for the plasma Aβ assay was 12%. As a quality control measure, we included both a stock pooled plasma standard on each plate and a pooled plasma standard to which a known amount of Aβ peptide had been added. The data from any plates for which the values of the plasma standards are more than 10% from the mean established by previous experiments were discarded and the samples reanalyzed. Additionally, plasma Aβ values were determined by the average of two independent analyses performed on different days to reduce the contribution of plate-to-plate variation to the overall values. Neuroendocrine markers were measured with radioimmunoassays (RIAs) as described previously.15 Cortisol binding globulin (CBG) levels were measured in order to calculate free cortisol levels, given that approximately 95% of circulating cortisol is bound to CBG, and only the remaining 5% of free cortisol is biologically active.20 Due to limited availability of the supplies needed to make these measurements, blood from a random sample of participants from each of the two treatment groups was subjected to analysis (insulin n = 10, placebo n = 5). Only one participant discontinued the trial and was lost to follow-up due to moving out of state; thus analyses were conducted with trial completers. The primary outcome measure (memory savings score = delayed recall/immediate recall) and secondary outcome measures (Stroop voice onset times and errors for concordant and discordant trials, and DSRS scores) were each subjected to a repeated measures analysis of variance with treatment assignment as the between subjects factor, and phase of treatment (baseline vs end) as the within subjects factor. Covariates for all analyses included age, education, Mattis score, and an index of insulin resistance (difference in insulin values obtained at the 90-minute timepoint following standard meal ingestion on day 1 and day 21). Nonsignificant covariates were dropped from the model. Interactions with covariates were examined in exploratory analyses with Pearson correlation. Effect sizes were estimated using Cohen’s f2, in which 0.02, 0.15, and 0.35 represent small, medium, and large effects.21 There were very few missing data points (<2% overall, with only one point missing for the primary outcome measure). Missing data were replaced using a conservative, last observation carried forward approach; thus practically, because the study design involved two measurements (baseline and post-treatment), when post-treatment scores were missing they were replaced with the subject’s baseline values. There was no instance in which post-treatment values existed but baseline values were missing. If both baseline and post-treatment values were missing, as was the case for some biochemical assays due to difficulty with venous access, and for three participants who were unable to comprehend/complete the computerized Stroop test, the participant was dropped from analysis. Intranasal insulin reduced postprandial plasma insulin levels. Analysis of the primary outcome measure showed that relative to their baseline performance, insulin-treated subjects had greater memory savings at day 21 than did placebo-assigned subjects [figure 2A; F(1,22) = 4.91, p = 0.0374; effect size f2 = 0.22]. Insulin treatment also improved performance on a secondary outcome measure, resulting in faster average performance on the selective attention test. As predicted, this effect that was restricted to discordant items requiring response inhibition [figure 2B; F(1,19) = 7.98, p = 0.0108; effect size f2 = 0.43], with no change performance on the concordant items or in number of errors (data not shown, p = 0.9836 and 0.8383). This pattern suggests that insulin affected cognitive processes relating to selective attention rather than simple enhancement of response speed or speed-accuracy trade-off. The effects of insulin treatment on caregivers’ ratings of participants’ functional status (DSRS) was dependent on disease status at baseline [F1,19 = 4.45, p = 0.0485; effect size f2 = 0.27]. 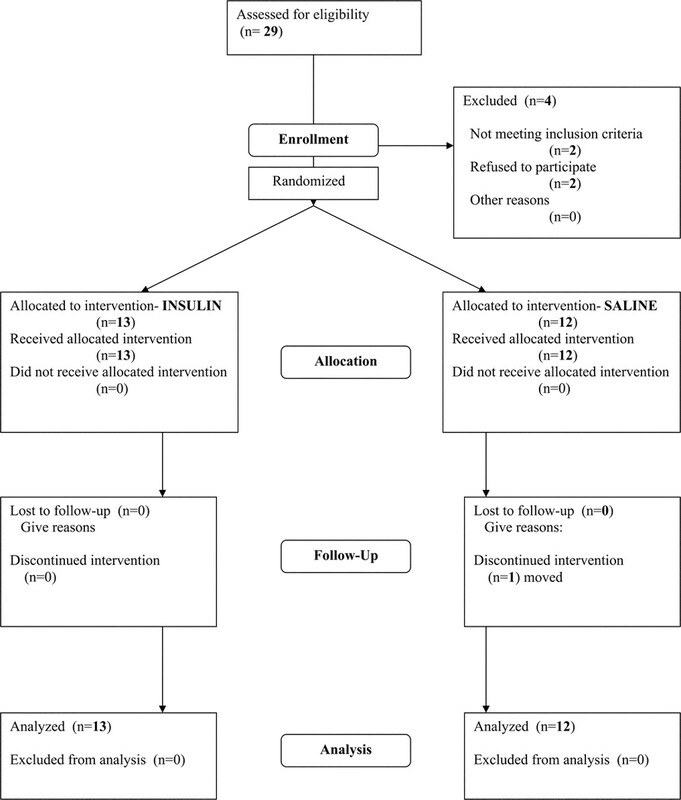 Exploratory ancillary analysis revealed that insulin-treated participants with more severe impairment at baseline were rated by their caregivers as showing greater functional improvement (figure 3A; r = −0.66, p = 0.0196), whereas no functional changes were observed by caregivers of placebo-assigned participants (figure 3B; r = 0.31, p = 0.3475). (A) Mean memory savings scores (SEM) at baseline (day 0) and at the end of treatment (day 21) for placebo-assigned and insulin-treated groups. Patients treated with insulin showed increased memory savings over the 21-day period relative to placebo (p = 0.0499). (B) Mean voice onset time (SEM) for discordant trials at baseline (day 0) and at the end of treatment (day 21) for placebo-assigned and insulin-treated groups. Patients treated with insulin showed faster response time over the 21-day period relative to placebo (p = 0.0490). (A) Insulin-treated patients with more severe dementia were rated by caregivers as showing greater functional improvement than less severely impaired patients (r = −0.66, p = 0.0196). (B) No change in status or relationship with dementia severity were observed for placebo-assigned subjects. Intranasal insulin modulated plasma β-amyloid levels. Fasting Aβ40 levels increased over the 21-day period for insulin-treated adults, whereas placebo-assigned subjects showed a slight insignificant decline [figure 4A; F(1,22) = 4.54, p = 0.0444; effect size f2 = 0.20]. No changes were observed in fasting Aβ42 levels (figure 4B; p = 0.5373). 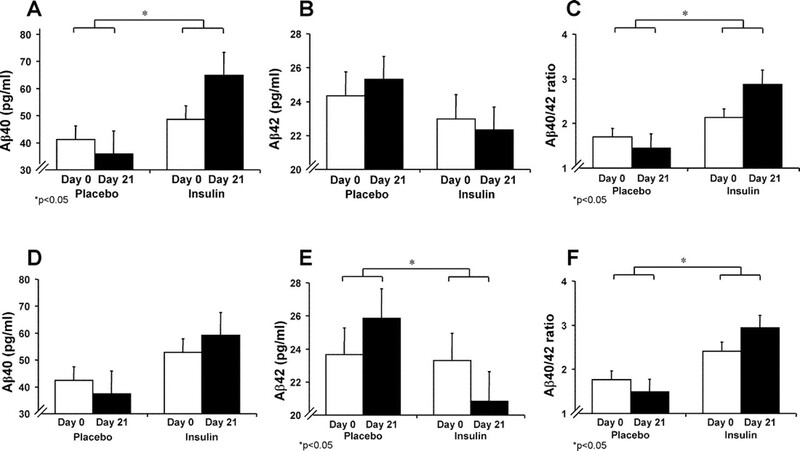 Insulin-treated adults fasting Aβ40/42 ratios increased over the 21-day period compared to placebo-assigned participants [figure 4C; F(1,22) = 6.21, p = 0.0207; effect size f2 = 0.28], reflecting increased Aβ40 levels relative to Aβ42. (A) Patients treated with insulin showed increased fasting plasma Aβ40 over the 21-day period relative to placebo (p = 0.0444), whereas no changes were observed for the placebo-assigned group. (B) No changes were observed in fasting Aβ42 levels. (C) The fasting Aβ40/42 ratio increased for the insulin-treated, but not placebo-assigned group (p = 0.0207). (D) No changes were observed in Aβ40 levels 90 minutes following a standard meal for insulin-treated or placebo-assigned groups. (E) Postprandial Aβ42 levels decreased for insulin-treated participants, but not for the placebo group. (F) The postprandial Aβ40/42 ratio increased for the insulin-treated, but not placebo-assigned group (p = 0.0227). We next examined whether intranasal insulin treatment influenced Aβ levels obtained 90 minutes following a standard meal. Postprandial Aβ40 levels were unaffected by insulin treatment (figure 4D; p = 0.2076). Day 21 postprandial Aβ42 levels were lower relative to baseline for the insulin-treated group, but not the placebo assigned group [figure 4E; F(1,22) = 4.09, p = 0.0554; effect size f2 = 0.19], and the postprandial Aβ40/42 ratio increased over the 21-day period for insulin-treated adults [figure 4F; F(1,20) = 6.10, p = 0.0227; effect size f2 = 0.30]. Plasma Aβ changes correlated with insulin-induced cortisol reduction. Changes in free cortisol over the 21-day period differed according to treatment [mean cortisol (standard error) on day 1 and day 21 for placebo group = 7.7 (1.9) and 7.3 (1.1); for insulin group = 10.7 (1.2) and 8.9 (0.8); F(1,12) = 7.31, p = 0.0205; effect size f2 = 0.66], with insulin-treated participants showing decreased cortisol levels [F1,8 = 10.09, p = 0.0157]. No changes were observed for the placebo-assigned group (p = 0.3947). For insulin-treated patients, the degree of change in cortisol was correlated with changes in fasting Aβ40 levels; subjects with greater reductions in cortisol levels had greater increases in Aβ40 levels (r = −0.71, p = 0.0215). No association was observed between cortisol and Aβ42, or with postprandial Aβ levels. No serious adverse events occurred. In general, intranasal insulin treatment was well tolerated, with only minor adverse events: headache (1 insulin), nasal dripping (2 placebo, 1 insulin), weakness (1 insulin), sneezing (1 placebo), blood glucose between 60 and 70 mg/dL (1 insulin). Intranasal insulin benefited patients with early AD, improving cognition and modulating peripheral markers of disease pathology. Insulin in the CNS affects several physiologic processes related to memory, such as hippocampal firing rate, components of the long term potentiation cascade, hippocampal glucose metabolism, and modulation of acetylcholine levels.1 Any one or more of these effects may have contributed to our finding that insulin treatment improved retention of new information after a delay, a function that is impaired at the earliest stages of AD. Insulin treatment also improved participants’ ability to selectively attend to a designated feature and inhibit a prepotent response, a cognitive operation modulated by noradrenergic input to frontal regions.23 This finding is consistent with our previous report that raising insulin in CNS through IV administration increased norepinephrine levels in CSF in older adults.15 Additionally, intranasal insulin treatment improved caregivers’ impression of functional status for patients with more severe (albeit still early stage) dementia. This relationship may reflect the relatively preserved functional abilities of the participants who were diagnosed with amnestic MCI. Such patients may require longer treatment periods in order to produce detectable functional changes, or assessment with a more sensitive measure to detect subtle changes in functional abilities. Our findings are consistent with previous work suggesting that raising CNS insulin levels indirectly via IV infusion or directly via single acute intranasal administration enhances memory in AD.3,24 Our study extends these findings and demonstrates that short-term, daily intranasal insulin administration enhances memory and selective attention. One limitation of our study is the possibility that improvement observed on day 21 might be an effect of the previous day’s insulin administration, or even represent a decline over some hypothetical early effect of insulin. Given that testing occurred 12 to 16 hours following the previous day’s insulin dose, memory improvement could not be due to a direct acute effect of insulin. However, future studies of longer term administration with repeated testing points are needed to conclusively demonstrate cumulative effects of treatment. A second limitation of our study is that only participants with mild AD or MCI were included. Thus the generalizability of our results to patients with more severe disease is unknown. As previously reported, fasting insulin levels were unchanged with intranasal insulin administration. In contrast, insulin treatment decreased postprandial plasma insulin levels. This possibility has not been examined in previous human studies, which have focused primarily on fasting parameters. Our findings are consistent, however, with studies demonstrating that enhanced CNS insulin signaling reduces plasma insulin and improves peripheral insulin sensitivity in animal models of insulin resistance.25 Theoretically, peripheral hyperinsulinemia may be a compensatory response to the reduced CNS signaling that accompanies insulin resistance, and thus correcting brain insulin signaling defects may eliminate the need for this compensatory response. In the present study, intranasal insulin administration increased fasting and postprandial Aβ40/42 ratios, but accomplished this effect through different mechanisms. Fasting Aβ40 levels increased for insulin-treated adults, whereas Aβ42 levels were unchanged. Lowered glucocorticoid levels may constitute one mechanism through which insulin treatment modulates plasma Aβ, given that fasting Aβ40 elevations correlated with changes in plasma cortisol over the 21-day treatment period. Intranasally administered insulin is thought to reduce glucocorticoid levels as a result of improving hippocampal inhibition of the hypothalamic-pituitary-adrenal axis.9 Glucocorticoids influence Aβ production via effects on levels and cleavage of the amyloid precursor protein. Increasing glucocorticoids to stress levels in an AD mouse model raised brain Aβ12; however, both Aβ40 and Aβ42 were affected, in contrast to the present results, suggesting that insulin may invoke additional mechanisms. Similarly, long-term glucocorticoid administration increased brain Aβ42 levels and reduced fasting plasma Aβ42 in aged macaques, but did not affect Aβ40.28 Given that both studies involved supraphysiologic doses of glucocorticoids, their relevance to our findings is unclear; however, they serve to illustrate that modulation of glucocorticoids can affect Aβ levels in plasma and brain. In contrast to changes observed for participants while fasting, intranasal insulin administration decreased Aβ42 levels measured 90 minutes following a standard balanced meal, and thereby reduced the Aβ40/42 ratio. This effect may reflect a “normalization” of the action of postprandial elevations of peripheral insulin; in previous work, raising peripheral insulin to normal postprandial levels reduced plasma Aβ42 levels for normal adults, but not for patients with AD.10 Although our results raise interesting questions about the influence of CNS insulin on peripheral Aβ and insulin regulation, the significance of these observations and their underlying mechanisms are unclear at the present time. Intranasal drug delivery is a potentially powerful therapeutic tool that allows large molecules to bypass the blood–brain barrier and directly access the CNS. Our results provide the first evidence of cognitive improvement following daily intranasal peptide administration for patients with early AD, and may serve as an impetus for a panoply of future efforts with insulin and other promising therapeutic agents. Our results also support brain insulin signaling as a promising target in the search for new therapeutic avenues in AD. e-Pub ahead of print on October 17, 2007, at www.neurology.org. Supported by the Department of Veterans Affairs, the Institute for the Study on Aging, and National Institute on Aging RO1 AG027415. Disclosure: W.D. is a founding member of Kurve Technology, the maker and patent holder of the electronic atomizer used in this study. W.D. holds equity interest in excess of $10,000 in Kurve Technology. The remaining authors have nothing to disclose. Received March 15, 2007. Accepted in final form June 27, 2007. Craft S, Watson GS. Insulin and neurodegenerative disease: shared and specific mechanisms. Lancet Neurol 2004;3:169–178. Haan MN. Therapy Insight: type 2 diabetes mellitus and the risk of late-onset Alzheimer’s disease. Nat Clin Pract Neurol 2006;2:159–166. Craft S, Peskind E, Schwartz MW, Schellenberg GD, Raskind M, Porte D Jr. Cerebrospinal fluid and plasma insulin levels in Alzheimer’s disease: relationship to severity of dementia and apolipoprotein E genotype. Neurology 1998;50:164–168. Hoyer S. Glucose metabolism and insulin receptor signal transduction in Alzheimer disease. Eur J Pharmacol 2004;490:115–125. Zhao L, Teter B, Morihara T, et al. Insulin-degrading enzyme as a downstream target of insulin receptor signaling cascade: implications for Alzheimer’s disease intervention. J Neurosci 2004;24:11120–11126. Freude S, Plum L, Schnitker J, et al. Peripheral hyperinsulinemia promotes tau phosphorylation in vivo. Diabetes 2005;54:3343–3348. Kaiyala KJ, Prigeon RL, Kahn SE, Woods SC, Schwartz MW. Obesity induced by a high-fat diet is associated with reduced brain insulin transport in dogs. Diabetes 2000;49:1525–1533. Thorne RG, Pronk GJ, Padmanabhan V, Frey WH II. Delivery of insulin-like growth factor-I to the rat brain and spinal cord along olfactory and trigeminal pathways following intranasal administration. Neuroscience 2004;127:481–496. Benedict C, Hallschmid M, Hatke A, et al. Intranasal insulin improves memory in humans. Psychoneuroendocrinology 2004;29:1326–1334. Kulstad JJ, Green PS, Cook DG, et al. Differential modulation of plasma b-amyloid by insulin in patients with Alzheimer disease. Neurology 2006;66:1506–1510. Mayeux R, Honig LS, Tang MX, et al. Plasma Ab40 and Ab42 and Alzheimer’s disease: relation to age, mortality, and risk. Neurology 2003;61:1185–1190. Green KN, Billings LM, Roozendaal B, McGaugh JL, LaFerla FM. Glucocorticoids increase amyloid-beta and tau pathology in a mouse model of Alzheimer’s disease. J Neurosci 2006;26:9047–9056. Gauthier S, Reisberg B, Zaudig M, et al. Mild cognitive impairment. Lancet 2006;367:1262–1270. Craft S, Asthana S, Cook DG, et al. Insulin dose-response effects on memory and plasma amyloid precursor protein in Alzheimer’s disease: interactions with apolipoprotein E genotype. Psychoneuroendocrinology 2003;28:809–822. Fishel MA, Watson GS, Montine TJ, et al. Hyperinsulinemia provokes synchronous increases in central inflammation and b-amyloid in normal adults. Arch Neurol 2005;62:1539–1544. Djupesland PG, Skretting A, Winderen M, Holand T. Bi-directional nasal delivery of aerosols can prevent lung deposition. J Aerosol Med 2004;17:249–259. Wicklund AH, Johnson N, Rademaker A, Weitner BB, Weintraub S. Word list versus story memory in Alzheimer disease and frontotemporal dementia. Alzheimer Dis Assoc Disord 2006;20:86–92. Spieler DH, Balota DA, Faust ME. Stroop performance in healthy younger and older adults and in individuals with dementia of the Alzheimer’s type. J Exp Psychol Hum Percept Perform 1996;22:461–479. Clark CM, Ewbank DC. Performance of the dementia severity rating scale: a caregiver questionnaire for rating severity in Alzheimer disease. Alzheimer Dis Assoc Disord 1996;10:31–39. Coolens JL, Van Baelen H, Heyns W. Clinical use of unbound plasma cortisol as calculated from total cortisol and corticosteroid-binding globulin. J Steroid Biochem 1987;26:197–202. Cohen J. Statistical power analysis for the behavioral sciences 2nd ed. Hillsdale, NJ: Lawrence Erlbaum Associates, 1988. Morton GJ, Cummings DE, Baskin DG, Barsh GS, Schwartz MW. Central nervous system control of food intake and body weight. Nature 2006;443:289–295. Arnsten AF, Li BM. Neurobiology of executive functions: catecholamine influences on prefrontal cortical functions. Biol Psychiatry 2005;57:1377–1384. Reger MA, Watson GS, Frey WH, 2nd, et al. Effects of intranasal insulin on cognition in memory-impaired older adults: modulation by APOE genotype. Neurobiol Aging 2006;27:451–458. Plum L, Belgardt BF, Bruning JC. Central insulin action in energy and glucose homeostasis. J Clin Invest 2006;116:1761–1766. Kumar-Singh S, Theuns J, Van Broeck B, et al. Mean age-of-onset of familial Alzheimer disease caused by presenilin mutations correlates with both increased Ab42 and decreased Ab40. Hum Mutat 2006;27:686–695. Bentahir M, Nyabi O, Verhamme J, et al. Presenilin clinical mutations can affect gamma-secretase activity by different mechanisms. J Neurochem 2006;96:732–742. Kulstad JJ, McMillan PJ, Leverenz JB, et al. Effects of chronic glucocorticoid administration on insulin-degrading enzyme and amyloid-beta peptide in the aged macaque. J Neuropathol Exp Neurol 2005;64:139–146.